(916) 718-7449Call today for a free estimate! For more than a decade, Hardwood Floors Plus More has been the premier flooring contractor for the city of Sacramento and the surrounding areas. We are a local, family-owned and -operated business dedicated to providing our clients with exceptional service and the very best in quality workmanship. When it comes to hardwood flooring in Sacramento, CA, there’s no one with more experience or expertise than Hardwood Floors Plus More. We install, repair, refinish and maintain hardwood flooring to a level that’s unparalleled by other flooring contractors, and we take pride in the workmanship we’re able to provide to our customers. From the installation of a brand new hardwood floor, to comprehensive repairs and restoration to breathe new life into an existing one, we’ll put in the effort and go the extra mile to make sure you’re left with nothing short of luxurious and beautiful floors in your living space. We are licensed, bonded and insured for your peace of mind. We’re a Better Business Bureau (BBB) accredited business. We have a superior reputation on Angie’s List. We serve a 50-mile radius around Sacramento. Our prices are always competitive! "I'm so happy with John and his work. He made refinishing my hardwood floor totally stress free. John is the best because 1. His price is the..."
"I live in a midcentury Sacramento home that happened to have really nice (a little water damage and not touched in decades) hardwood underne..."
"John was professional from the start. He kept to his timeframe and my floors are beautiful. I looked for months before finding Hardwood Floo..."
April 5, 2016 John K.
"He is a true professional. His bid was complete and accurate, and it included work he knew would be there because of his experience and x-ra..."
January 12, 2016 Nathan B. "John and his crew did an amazing job in my house! My only regret was not consulting John in the process of purchasing my hardwood floor. 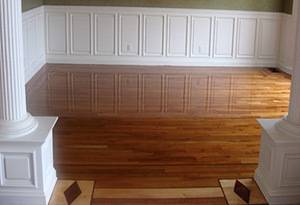 I w..."
Looking to make an investment in quality, alluring hardwood flooring? Contact Hardwood Floors Plus More today and learn more about how we can bring the beauty of hardwood into your home.